To add to the Pope’s suffering there is the gravity of scandal caused by a large majority of U.S. Cardinals and Bishops who aid and abet hundreds of U.S. ‘Catholic’ politicians, both Democrat and Republican, in their support of abortion while continuing sacrilegious reception of Holy Communion. Because the Pope has no prisons for disobedient hierarchy, the Catholic faithful have no other recourse than to write en masse to the Pope regarding out-of-control U.S. bishops such as Archbishop Donald W. Wuerl, Archbishop of Washington. Do you agree that Archbishop Donald W. Wuerl of the Archdiocese of Washington, D.C. should obediently enforce Canon 915 of the Code of Canon Law as the Vatican has explicitly instructed all bishops to do? If you agree, would you be willing to write the Pope a letter, asking him not to appoint activist Archbishop Wuerl to the College of Cardinals? 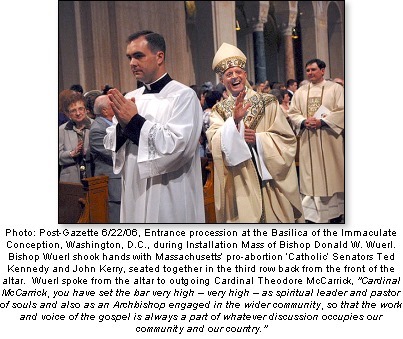 Then, perhaps, Archbishop Wuerl would become obedient to the Pope. Why reward a disobedient Archbishop who gives scandal to millions of faithful? I will show you at the bottom of this column how there is a way our letters might actually be read by the Pope. This is an important time for such a letter writing campaign. There is usually a consistory of the Cardinals called by the Pope in February or in June for the purpose of naming new Cardinals. Usually, an Archbishop will not receive the red hat as long as the previous Cardinal is still alive [in this case, that would be Cardinal Theodore McCarrick]. However, Washington, D.C. is too important a Cardinal 'See' for the Pope not to make an exception to the usual practice. Therefore, a letter writing campaign to the Holy Father may be most effective at this time, explaining why you believe Archbishop Wuerl’s disobedience should not be rewarded with the red hat of a Cardinal. Below is a wealth of information or 'talking points' that you could use in your letter to the Pope. However, we must discipline ourselves to keep the letter brief and concise, preferably one page in length. 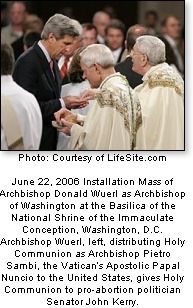 June 22, 2006 Installation Mass of Archbishop Donald Wuerl as Archbishop of Washington at the Basilica of the National Shrine of the Immaculate Conception, Washington, D.C. Archbishop Wuerl, left, distributing Holy Communion as Archbishop Pietro Sambi, the Vatican’s Apostolic Papal Nuncio to the United States, gives Holy Communion to pro-abortion politician Senator John Kerry. Also provided herein are very helpful, substantiated hyperlinks. Each of these links could be printed out and attached to your letter to the Pope, if you so desire. It is important that we keep our letter to the Pope very polite and kind. Our letter should show it is written by a faithful Catholic who has grave concerns regarding Archbishop Donald Wuerl's disobedience. - Archbishop Donald Wuerl of Washington recently told journalist Allyson Smith that he would not discipline nor deny Holy Communion to House Speaker Nancy Pelosi, nor to other Catholic politicians who promote and legislate procured abortion. Wuerl knows well that Pelosi, a dissident Catholic who calls herself a ‘conservative Catholic,’ has repeatedly voted 100% to uphold abortion and abortion of partially born children who are up to 9-months of age in the womb, as well as voted against parental notification when minor girls seek murderous abortions. - Archbishop Wuerl recently told reporters it is his policy that those who are manifestly [publicly] obstinate and persistent in their grave sins are not to be disciplined but are to be catechised in the faith. - Pro-abortion ‘Catholic’ congressman Nancy Pelosi departs Notre Dame Chapel at Trinity University in Washington, D.C. after her sacrilegious reception of Holy Communion. Mass celebrant was dissident priest, Fr. Robert Drinan, S.J. - How is it that Archbishop Wuerl can refuse to discipline Nancy Pelosi? 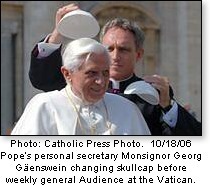 He is in obstinate opposition to Cardinal Ratzinger's [now Pope Benedict XVI] Eucharistic instruction to the United States Conference of Catholic Bishops [USCCB] during their June 2004 Denver conference. Entitled 'Worthiness to Receive Holy Communion,' Cd. Ratzinger warned the U.S. Bishops regarding pro-abortion politicians trying to receive the Eucharist sacrilegiously: "The minister of Holy Communion must refuse to distribute it." Cardinal Ratzinger did not say 'could,' or 'may,' but that the minister 'must' refuse to give it. - It is time for U.S. Catholic laity to ask the Pope if Archbishop Wuerl can continue to ignore what His Eminence Francis Cardinal Arinze, Prefect for The Congregation for Divine Worship and the Discipline of the Sacraments, strongly warned the U.S. bishops in April 2004, that a pro-abortion politician "is not fit" to receive Holy Communion, adding, "If they should not receive, then they should not be given." - For the past several years, the USCCB has denied ‘Rainbow Sashers’ from receiving Holy Communion. These are persons publicly wearing the ‘gay and lesbian’ rainbow colors and who either live the ‘gay’ and ‘lesbian’ lifestyle or who promote it. Why is it that the USCCB will not deny public politicians promoting and legislating procured abortion from receiving Holy Communion? Is not murder of the child just as evil as sodomite lust in the eyes of God? - In August 2005, as Bishop of Pittsburg, Wuerl released a statement entitled: “Episcopal Pastoral Decisions and Ecclesial Communion.” In his statement, Bishop Wuerl called for all bishops of the USCCB to consult with each other on ‘controversial issues’ before taking individual action. Then, having arrived at a majority consensus, a decision would be imposed by the USCCB upon all bishops. Wuerl’s statement clearly confronted Archbishop Raymond L. Burke, Archbishop of St. Louis, and 11 other active U.S. diocesan bishops, plus 2 inactive bishops. Out of the 226 dioceses in the U.S., only 14 diocesan bishops publicly stated they must deny the Eucharist to persons who obstinately persist in their grave manifest sins. In other words, the 14 active diocesan bishops who opposed Holy Communion for persons who were persistent and obstinate in their grave manifest sins caused real difficulties for the other 212 active diocesan bishops. In addition, Bishop Wuerl's proposed statement wrongfully intended to silence and restrain those 14 faithful bishops in their own Sees, especially during a time when the Catholic Church in America desperately needs for its bishops to not be afraid to lead. - Bishop Rene Gracida and Fr. J. Patrick Serna wrote a most revealing essay entitled ‘A Mechanism for Restraint: An Analysis of a Proposal To Rein in Activist Bishops.’ The well-documented and important essay explains Archbishop Wuerl's statement as a source of confusion couched in obfuscating language and an attempt to silence faithful bishops. - Canon 915 of the Code of Canon Law definitely teaches the person who is persistently obstinate in his or her grave manifest sin must be denied the Eucharist. "When a 'Catholic' pro-abortion politician knows the actions he or she has taken are gravely sinful in a public matter like supporting and legislating abortion, the only way to uphold church teaching is to withhold Holy Communion from them. It is not right for one bishop to give the Eucharist and for another not to, according to Canon Law, Canon 915." - Canon Law expert Archbishop Raymond Burke said: "Canon 915 is not an option. Those persons who obstinately persist in grave manifest sin after having been spoken to by their bishop, must be denied the Eucharist." - The period of time that it takes a bishop to privately warn the sinner is relatively short, a matter of days or weeks. A letter is sent to the obstinate sinner in question, asking to meet with the bishop who will clarify the church's teachings and remind the manifest sinner he or she is jeopardizing the life of their eternal soul. If the sinner refuses to meet with the bishop, the bishop further informs the public sinner of the gravity of his or her actions. If the sinner still remains obstinate and persists in his or her mortal sin in a manifest way, then the bishop notifies his priests and deacons that the sinner should be denied Holy Communion. The catechesis of the faith will continue from the Bishop to the sinner for however long it takes, but until the public sinner's public conversion, the Eucharist is to be denied. - If Archbishop Wuerl remains disobedient, the result will be the continued disintegration of the Catholic Church's infallible teachings regarding the right to life for the unborn. - In a recent address, Archbishop Burke spoke about the importance of causing scandal to others: "So serious is the moral obligation to avoid scandal that we are admonished not only not to do wrong but also not to appear to do wrong. When a person acts, he or she must always consider the appearance of the act to be done." - Recently, Fr. Tom Euteneuer, president of Human Life International, a prominent worldwide pro-life organization, told LifeSite.com: "I don't believe Archbishop Wuerl is doing his job," and that Ms. Pelosi should be excommunicated. 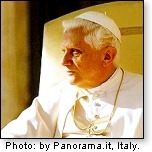 For this work of letter writing to be effective, Pope Benedict himself must read the letters. With a billion Catholics in the world, you can see the problem one has; it is simply impossible for the Pope to see, much less read, the thousands of letters that pour into the Vatican every day addressed to him. Letters addressed to the Pope that are not from a bishop get delivered at the office of the Secretary of State where they are read by monsignors and are answered by the Office of the Secretary of State or are delivered to the Nuncio to be answered by him or are delivered to the Ordinary of the diocese of the writer to be answered by him. 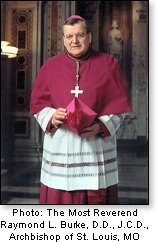 Monsignor Georg Gäenswein, private secretary to Pope Benedict XVI. I have reasons to believe that a letter written to the Pope concerning Archbishop Donald W. Wuerl, enclosed in an envelope addressed to the Pope's private secretary, Monsignor Georg Gäenswein, would in fact reach the pope. In addition, within the same envelope addressed to Monsignor Gäenswein, wisely write a separate and very short request to Monsignor Gäenswein, 'begging' him to give your enclosed letter to the Pope. When the Monsignor reads your polite letter to the Pope, it may compel him to give the Pope your letter. For all that I have read and have been told about how mail delivery works at the Vatican, I believe that mail addressed to Monsignor Gäenswein actually reaches Monsignor Gäenswein. 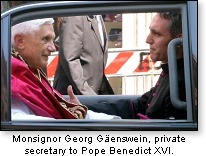 Therefore, may I repeat, we should address the outside envelope to Monsignor Gäenswein, put our concise letter to the Pope [including any attachments you have printed out] in the same envelope, and lastly include a short request to Monsignor Gäenswein begging him to give your letter to the Pope.